The interim budget, presented by the Finance Minister, is a progressive budget for small taxpayers and real-estate sector. The proposals made in the interim budget would provide immediate relief to small taxpayers and incentivize the salaried taxpayers, who have continuously been accredited as the most honest taxpayers. The incentives proposed for the taxpayers would be beneficial both for revenue and taxpayers. The taxpayers would save a few thousand rupees from their tax expense and the revenue would get the opportunity to reduce its administrative cost. Low-income groups and senior citizens generally have pension income, interest income and rental income. The budget has either extended the tax benefits or reduced the compliance burden in respect of all these incomes. When Govt. keep the small taxpayers out of tax ambit, it saves enormous amount of interest that it eventually pays on the tax refunds. Currently, the Section 87A provides relief of up to Rs. 2,500 to a resident individual if his total income does not exceed Rs. 3,50,000.The relief under Section 87A is proposed to be increased to Rs. 12,500, which shall be available to those resident individuals whose total income does not exceed Rs. 5,00,000 during the Previous Year 2019-20. It is proposed to increase the limit of standard deduction for the salaried taxpayer from existing Rs. 40,000 to Rs. 50,000. The benefit of increased standard deduction shall be available to salaried persons and pensioners. Threshold limit for deduction of tax from interest (other than interest from securities) paid or payable by a banking company or Co-operative bank or Post office is proposed to be increased from Rs. 10,000 to Rs. 40,000. Every person (including an individual or HUF who are subject to tax audit) shall be required to deduct tax under Section 194-I from payment of rent. The tax shall be deducted if the amount of rent paid or payable during the financial year exceeds Rs. 1,80,000. This threshold limit, for deduction of tax, is proposed to be increased from Rs. 1,80,000 to Rs. 2,40,000. Any long-term capital gains, arising to an Individual or HUF, from the sale of residential house property is exempted to the extent such capital gains are invested in another residential house property. The taxpayer is allowed to invest only in one residential house in India to claim section 54 relief. 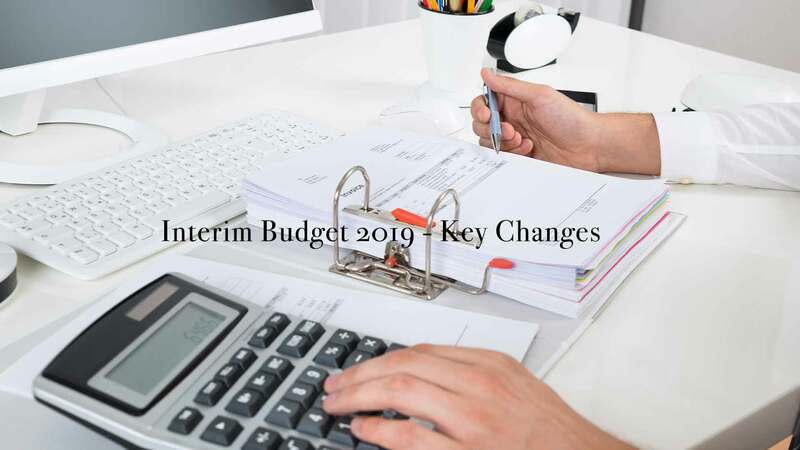 The Finance Bill, 2019 proposes to extend the exemption for investment made, by way of purchase or construction, in two residential houses provided the amount of capital gains does not exceed Rs. 2 crores. If the assessee exercises this option, he shall not be subsequently entitled to exercise the option for the same or any other assessment year i.e. the assessee can exercise this option only once in a lifetime. Deduction under section 80-IBA is allowed in respect of profits and gains derived from the business of developing and building affordable housing projects subject to certain condition, inter-alia, the housing project should be approved on or before March 31, 2019.It is now proposed to extend the time limit for approval of the housing projects by one year i.e. till March 31, 2020. If an individual owns more than one house property for his own residence then only one house property, as per his choice, would be treated as self-occupied and its annual value is deemed as nil. The other house property is deemed to be let-out as per Section 23 and notional rent of such house is taxed under the head 'House Property'. The Finance Bill, 2019 has proposed to amend this provision by allowing an option to the assessee to claim nil annual value in respect of any two houses declared as self-occupied. In other words, a taxpayer can now claim that he has two self-occupied house properties. Consequently, deduction with respect to interest on borrowed capital can be claimed with respect to both the houses. However, the aggregate monetary limit for the deduction would remain same, i.e., Rs. 2,00,000. Considering the socio-economic need of middle-class families to maintain houses at two locations on account of their job, children's education, care of parents etc., this relief would address the genuine concerns of house owners. 8. Govt. to designate collecting agencies to collect stamp duty on instruments of transaction in stock exchanges. The Finance Bill, 2019 proposes amendment in Indian Stamp Act, 1899 for better administration of stamp duty collection on securities market instruments. It proposes that Stamp duties would be levied on one instrument relating to one transaction and would be collected at one place through the Stock Exchanges. The duty so collected will be shared with the State Governments on the basis of domicile of buying client. The Finance Bill, 2019 seeks to amend Section 8(3) of the Prevention of Money-laundering Act, 2002 so as to extend the period of investigation from 90 days to 365 during which the attachment shall remain valid. It also provides that in computing the period of 365 days, the period during which the investigation is stayed by any court shall be excluded. To promote "Make in India", the Finance Bill, 2019 rationalizes custom duty and procedures. The Custom Duty has been abolished on 36 Capital Goods.